AMC’s Fear the Walking Dead Season Four will arrive on Blu-ray and DVD March 5. Included in the 16-episode set are four audio commentaries (episodes 401, 405, 410, 416) featuring executive producer and Walking Dead chief content officer Scott Gimple, Fear showrunners Andrew Chambliss and Ian Goldberg, director Michael Satrazemis and stars Alycia Debnam-Carey, Jenna Elfman and Garret Dillahunt. Fear the Walking Dead’s fourth season emerged as the highest-rated season yet of the Walking Dead spinoff, earning an 81 percent “fresh” on review aggregator Rotten Tomatoes to top its first (78 percent), second (70 percent) and third (80 percent) seasons. The first season to see creative involvement from Gimple, Fear underwent a major shakeup in the front half of the season when it killed longtime leading lady Madison Clark (Kim Dickens) in its mid-season finale after porting over The Walking Dead star Lennie James as part of the first crossover between the flagship and the spinoff. That death proved controversial, coming just weeks after Fear navigated its first significant loss of the semi-rebooted season when fan-favorite Nick Clark (Frank Dillane) was shot and killed by young orphan Charlie (Alexa Nisenson). Goldberg and Chambliss later defended the decision to kill Madison and install James’ Morgan as lead, explaining the ferocious single mother had to die to better play out the selected “thematic idea and emotion” behind the season, which Goldberg said was “taking people from hopelessness toward that hope” Madison came to represent as the newfound leader of the Dell Diamond baseball stadium community. “Madison is the ultimate embodiment of hope. She's someone who is selfless. We see that not only she fights to protect her own family, but also to bring in people from the outside world who can help themselves into the shelter of the stadium. She's heroic in that way,” Goldberg said. Other newcomers boarded this past season included enemies Mel (Kevin Zegers) and the ‘Filthy Woman’ (Tonya Pinkins), video documentarian Althea (Maggie Grace), grifters Wendell (Daryl Mitchell) and Sarah (Mo Collins), nurse-turned-survivor June (Elfman) and gentle gunslinger John Dorie (Dillahunt), joining returning stars Debnam-Carey, Colman Domingo (Victor Strand) and Danay García (Luciana). Fear Season Five, now in production, will follow Morgan and company in their efforts to seek out strangers in need as led by the cache of tapes recorded by Althea. The group will come across former Savior Dwight (The Walking Dead’s Austin Amelio), marking the second crossover between both series in as many seasons. 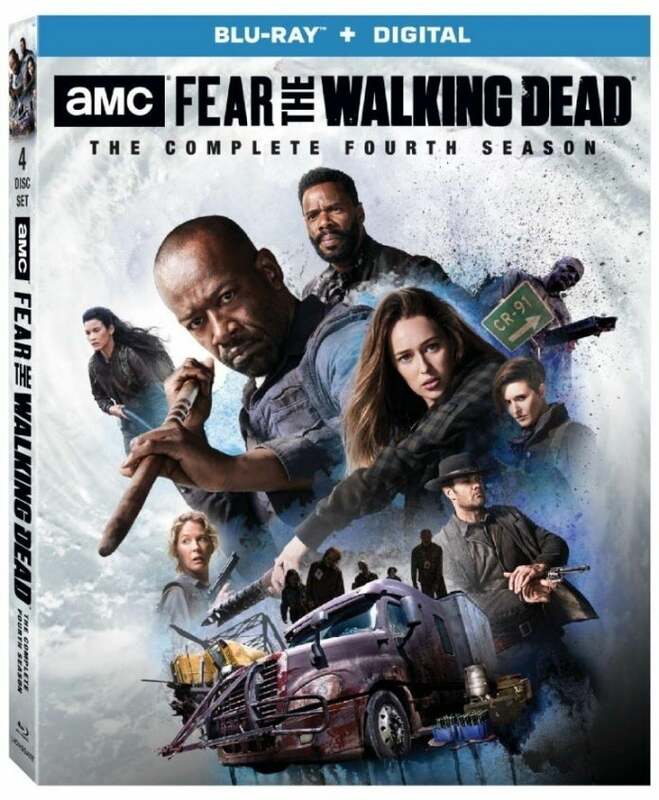 Lionsgate debuts Fear the Walking Dead Season Four on Blu-ray (+Digital) and DVD March 5.